Figure 8.12. 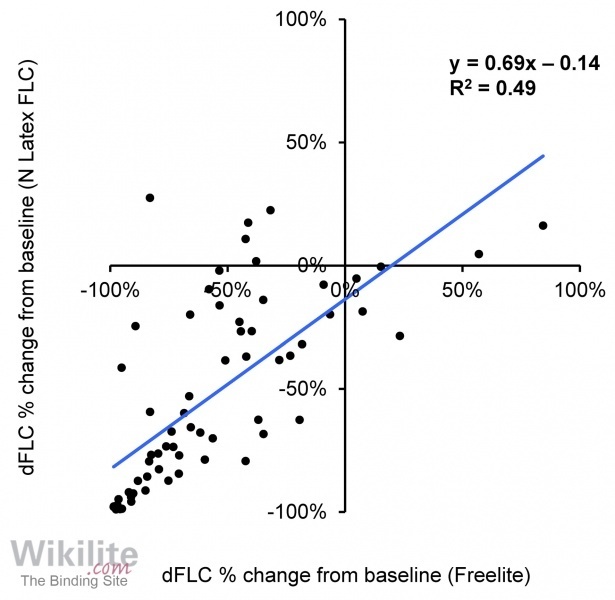 Correlation between Freelite and N Latex sFLC results for 17 MM patients with measurable disease. Results are expressed as the percentage change in dFLC (difference between involved and uninvolved FLC concentrations). Blue line: line of best fit. (Courtesy of R. Popat). Freelite assays are the only FLC assays recommended by name in International Myeloma Working Group guidelines, and an involved/uninvolved Freelite sFLC ratio ≥100 is designated as a biomarker of malignancy (Chapter 25.2.1) . Guidelines and response criteria that are based on Freelite data should not be applied to other FLC assays because of the poor concordance between the absolute values (Section 8.6.1) . A summary of clinical definitions that are based upon quantitative Freelite results are shown in Table 8.9. Table 8.9. A summary of international guidelines based on quantitative Freelite results. VGPR: very good partial response; dFLC: the difference between involved and uninvolved sFLC concentrations. Bossuyt et al. characterised N Latex FLC values in 50 patients (39 κ and 11 λ with an involved/uninvolved Freelite ratio ≥100. When the same cut-off was applied to N Latex FLC assays, only 28% (11/39) κ patients and 48% (11/23) λ patients had an involved/uninvolved N Latex FLC ratio ≥100. Similar findings were reported by Weisel et al. . After a number of alternative N Latex FLC thresholds were evaluated, Bossuyt et al. stated that optimal cut-offs were ≥30 and ≤0.03/≤0.02, for κ and λ patients respectively. However, such values would require extensive validation before they can be recommended for routine use. Popat et al. compared the assessment of response indicated by N Latex and Freelite FLC assays for 42 MM patients who had been treated after relapse. The response criteria used were those defined by Rajkumar et al. . A total of 17/42 patients had measurable disease by both assays and 11 by neither; one patient was evaluable by N Latex FLC only but 13 had measurable disease by Freelite only. For the 17 patients with measurable disease by both assays, there was poor agreement in the assigned response to treatment (Figure 8.12, weighted Kappa 0.75). Dejoie et al. compared the ability of N Latex and Freelite FLC assays to identify disease progression in LCMM patients according to IMWG guidelines. At clinical progression, Freelite confirmed progressive disease in 15/19 patients, compared to 11/19 by N Latex FLC assays. This study further supports the recommendation that IMWG guidelines based on Freelite data cannot be applied to the monoclonal assays. In their study of 177 MM patients from the IFM DFCI 2009 trial, Caillon et al. found that Freelite and the Sebia FLC ELISA do not provide equivalent classification of an involved/uninvolved sFLC ratio ≥100, a biomarker of malignancy originally defined using Freelite (34% discordance; kappa coefficient 0.38). Results were also not equivalent for response assignment (29% discordance; kappa coefficient 0.42). Of particular interest, 5 patients were assigned a stringent complete response (sCR) by Sebia FLC but were only assigned a very good partial response (VGPR) by Freelite, suggesting that Sebia FLC has reduced sensitivity for detecting residual monoclonal FLCs. Concordance for the IMWG FLC definition of progressive disease was just 77%. All but one of the discordant patients met progression criteria by Freelite but not by the Sebia FLC ELISA. Caillon et al. , referencing their own study and the work of Jacobs et al. note that since novel FLC assays are not interchangeable with the current reference method (Freelite), all new FLC assays require validation in large prospective studies before they can be adopted by the IMWG and included in clinical trials. 12. Jacobs JFM, de Kat Angelino CM, Brouwers H, Croockewit SA, Joosten I, van der Molen RG. Evaluation of a new free light chain ELISA assay: Bringing coherence with electrophoretic methods. Clin Chem Lab Med 2018;56:312-22.